Do you need to call in an excused absence? 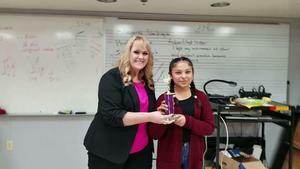 7th Grader Seneca Corral claimed 1st place at the Kern County Oral Language Festival, held at Stonecreek Junior High on January 26th. Seneca earned the top spot in the Serious Solo category for 7th and 8th graders with her interpretation of "Why Am I Not Good Enough?" by Olivia Vella, an Arizona middle schooler who gained acclaim with her lament of the pressures faced by teenage girls to present themselves as an unattainable ideal. Do The Math visits Stiern! 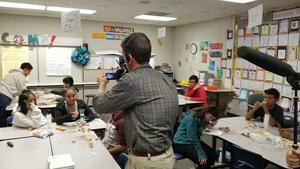 KETN-TV's long-running instructional program "Do The Math" visited Walter Stiern Middle School on November 27th. Students in the after-school program participated in the show's Science 4 Kern challenges, demonstrating growth mindset, collaborative problem-solving, and STEM design thinking. All students will be released at 12:53 pm all week, Conferences will be held in our cafeteria and will begin at 1:15 pm until 2:45 pm all week.